Why is it so hard to clean out our closets? Well, just about any article of clothing can carry a story, and preserving the tangible signs of a lifetime of emotional attachments may be the secret purpose of closets. It’s also the clever organizing principle of Love, Loss and What I Wore, currently staged by Girls Nite Out Productions at Main Street Landing’s Black Box Theater in Burlington. Sister playwrights Nora and Delia Ephron have written a sketchbook of characters for an ensemble of five female actors to portray in witty, fast-paced monologues. Clothing is a perfect entry point for women’s stories. From Madonna’s breast cones to those puzzling sleeveless turtlenecks of the 1970s to today’s take-charge boots, what women wear has a great deal to do with what they want, how they think of themselves and how others see them. The Ephrons have chosen an ideal metaphor, but they wield it only to make us feel more comfortable facing our flaws. I say “our” because the play is designed to forge a strong connection between actors and audience. Humor onstage can almost always build a bond, but confessional humor comes close to a blood pact. Gingy, the first character portrayed, makes us feel like we’re sharing a cup of tea with her after 40 years of friendship. The secret ingredient of this play is trust, and by the end, the audience and performers have reveled in sharing it. 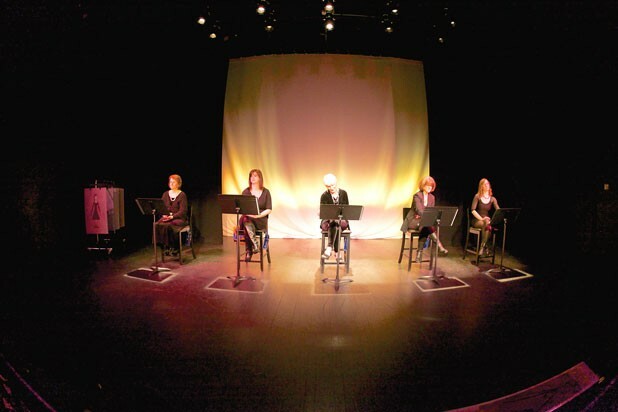 The play is presented as a staged reading: five stools, five music stands holding scripts, five actors. Director Kathryn Blume sees to it that the simple structure quietly supports vivid storytelling by drawing full, strong characterizations from the actors. Lighting design by Krissy Freeman provides nice visual variety, and Ann Vivian’s set is perfectly understated. Blume blends the styles and abilities of the five actors into a well-rehearsed ensemble. All the performers know how to hit their beats for laughs or emotional effect, but it’s the director’s careful attention to consistency of presentation that gives the play a harmonic quality. The show moves along briskly over 90 minutes, without intermission. A lineup of seated actors may not sound like the most engaging tableau, but this is a tight, high-energy group. The actors don’t mug for attention but earn it with intensity and focus. It’s up to the actors to keep the monologues lively, and they succeed within the limits of the script. Some stories don’t go much deeper than a brushstroke, while others let the actors complete a painting. But in all cases the performers appear delighted to bring the stories to life. Despite the easy format, there’s no coasting here. Those music stands hold lines the actors have memorized, and when transitions rely on dialogue instead of monologue, they work together with crisp precision. The five performers are accomplished at launching each new character from a running start. There’s no time to dawdle with a slow build — the play is a fusillade of fast starts and stops. Each of the actors relishes the demanding task. Ruth Wallman ably carries the show’s one narrative thread playing Gingy, the only person whose story builds in multiple monologues. Wallman lets her character blurt out her story’s twists and turns without a pause for self-consciousness, then shyly accepts our laughs, as sure of their inevitability as a grandmother is of her best cookie recipe. Nan Murat relishes her comic moments without milking them. When she speaks from hard-won perspective about a struggle to lose weight, she lets a sense of wonder prevail over bitterness. It’s easy to stand in her shoes, and when we wish she’d be less hard on herself, we’re talking to ourselves as well. As one of her characters, Sebastian Ryder moves effortlessly from comic to tragic and back again when an unremarkable bathrobe triggers a memory of a deceased mother. Ryder turns all her characters’ quirks into the kind of nutty, self-evident facts we know and cherish about our best friends. Stephanie Gallas has keen comic timing and is a master of closing out an anecdote for maximum impact. She sometimes lets the script’s superficial qualities take control, but in a neat little bridal duet with Ryder, she hits every conflicted note of the sartorial ordeal of planning a wedding with her mother. Natalie Miller sparkles when weighing the advantages of high heels (legs look great) against the disadvantages (brain stops working). Miller’s energy is infectious, and though she runs right up to the edge of overacting to wring every laugh out of her anecdotes, her comic takes are quite winning. What the production does best is demonstrate what happens when audience and actors share something intimate. On opening night, the sold-out house laughed so easily there was no mistaking the warmth in the room. Through the performers, the audience members had a chance to see themselves, whether remembering best-forgotten fashions or recalling a mother’s advice. One of the best aspects of Love, Loss and What I Wore is that it can be cast with women of any age. In this production, we get a young actor playing the scolding mother of an older one, a mature woman recreating her youth and a number of stories that are too timeless to be defined by age. With 28 scenes, everyone is called on to switch quickly from character to character. It’s a magnificent trick to see age — about which women are often self-conscious — cease to matter. There’s an art to exposing foibles so tenderly that the process triggers no shame. The Ephrons are not only sure-handed with wit and the monologue structure, they’re also compassionate toward the characters they create. These five actors demonstrate the great lift that comes from making peace with flaws by making fun of them. Of course, the confessional has its limits. The drawback to building a play that feels like a girls’ sleepover is that you can’t scale much of a height. And a series of vignettes doesn’t contain an overall dramatic arc. The play is cake, not a meal. With buttercream frosting, at that. The print version of this article was headlined "Clothes Make the Woman".